"The desert lands of Egypt will remain desert, however many millions of pounds are expended in Nile reservoirs. All that man can do is to extend somewhat the narrow strip of green running along the banks of the Nile ..."
As mentioned earlier, it was while acting as Sir John Fowler's assistant that Baker began his connection with Egypt. In around 1872 he worked with Fowler on plans for the construction of a combined irrigation / ship canal that was to run between Alexandria and Cairo, though it wasn't built. He was to play a significant part in the development of the country and worked on projects there throughout most of his career. His last visit to the region, just a few months before his death, was made in connection with the Nile project most-associated with his name — the Aswan Dam (or Assuan Dam, now Aswan Low Dam). 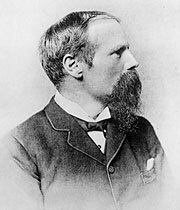 Among the many projects on which Baker (and Fowler before his death) advised the Egyptian Government were the Soudan (Sudan) Railway, the construction of Nile bridges at Cairo and Khartoum and the repair and augmentation of the Nile Delta Barrage. Britain invaded and occupied Egypt in 1882, establishing a protectorate that covered Sudan to the south. The Delta Barrage was successfully repaired, saving huge amounts of money and the labour of bonded workers who had irrigated the land by hand during the period when the barrage was broken. However, its repair made the issue of water supply upstream in the drier months more pressing. The Nile Valley depends on annual flooding for agriculutre and soil fertility. Control of water flow is a major issue. An international commission was established, and Baker was consulted along with respected engineers from France and Italy — Augustus Boulé and Giacomo Torricelli. They were to look at the possibility of building a dam across the River Nile. All three agreed that the first cataract (at Aswan, about 1,000km upriver from Cairo) would be the most effective location but Boulé expressed the view that the resultant flooding would submerge the ancient Egyptian temples of Philae, a price he thought unacceptable. He was right about the flooding and Baker later undertook strengthening and underpinning of the temples. In 1898, Baker, who was then 58 years of age, was appointed consulting engineer for the Aswan Dam project. Other engineers involved include Sir William Willcocks (1952-1932) who handled the overall design and supervised construction, Sir William Garstin, W.J. Wilson, A.L. Webb and M. Fitzmaurice. Baker was always quick to give others their due but decisions such as the appropriate height of the dam rested with him. The main contractor was John Aird & Co. The design was for a gravity dam, 1.9km long and 54m high. The dam proper consisted of a granite wall backed with cemented rubble infill and faced in coursed ashlar. The sluices, which enable the flow of silt-free water, were faced in fine ashlar to aid flow. The design of the sluices and lock gates, which enabled river navigation, were the subject of a subcontract. To start the project off, a coffer dam was constructed across the shallow rapids of the cataract, initially using rubble but later augmented with sandbags. "This was the most exciting time in the whole stage of operations, for no one could predict whether it would be possible to dry the bed, or whether the water would not pour through the fissured rock in altogether overwhelming volumes." The dam was completed in 1902 and opened on the 10th December by HRH the Duke of Connaught & Strathearn. Almost immediately, the need for controlling a greater volume of water was found necessary and Baker was commissioned once again. 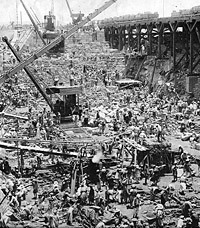 By 1908, after Baker's death, the works to complete the raising of the height of the Aswan Dam were complete. A second enlargement was undertaken 1929-33. Baker was also consultant for a subsidiary dam to Aswan, called the Assiut Barrage, built concurrently. During construction, Baker realised that if it could be finished a year earlier than scheduled, the tax revenue from the extra year's irrigated crops would more than cover the cost of speeding up the work. He took the bold decision to cancel the existing construction contract and pay the increased expense himself in advance of the tax receipts. This saved the government £600,000 and gained the country an extra year's supply of water. His last visit to the region, early in 1907 (he was to die in May), saw him personally touring the upper stretches of the Nile, from Aswan to Khartoum, to assess the possibility of building a dam elsewhere instead of raising the height of the Aswan Dam. He fell ill during this trip but regained his health on his return to England. In 1946, the Aswan Dam almost overflowed and it was decided to build a second dam, 6km further upstream. This is the Aswan High Dam, famously associated with the relocation of the temple of Abu Simbel. Both dams have ultimately caused a number of environmental and cultural problems, as well as bringing economic benefits. The damming of the Nile remains a political issue to this day and the ongoing debate has been further fuelled by Sudan's construction in recent years of a dam at the fourth cataract. 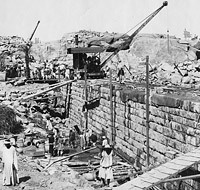 The west channel of the Aswan Dam (Aswan Low Dam) under construction. The photo dates from 1901. 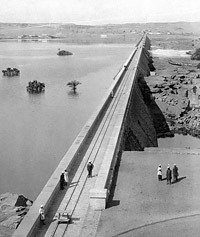 The 1.9km long Aswan Dam as it appeared in 1903. Note the rail tracks that run along the top of the dam wall. Official opening: 10th December 1902. A construction shot taken in 1907 during the works to raise the dam's height. 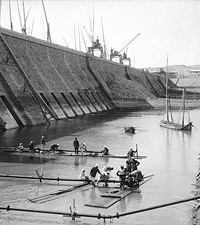 Constructing the Assiut Barrage (1899).